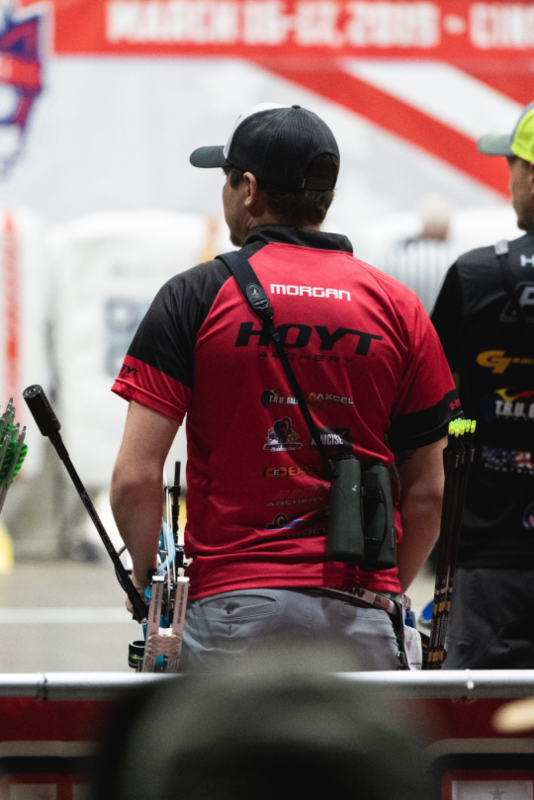 The official Tumblr of Hoyt Archery. 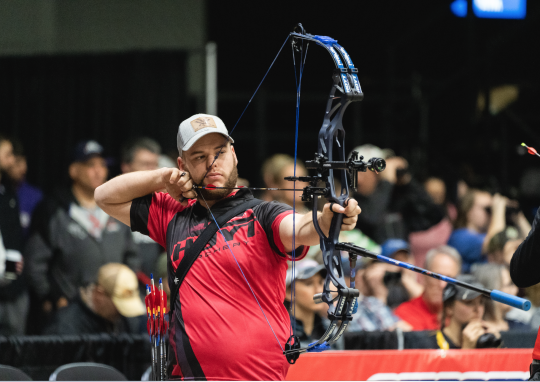 YANKTON, South Dakota — The First Dakota Classic attracted archers from around the globe to come compete at the NFAA headquarters. Some archers trekked through snow and ice in an unexpected April storm. The Classic holds a unique format with the qualification round consisting of 4 ends of 5 arrows shot at 3 distances, beginning with the closest distance. 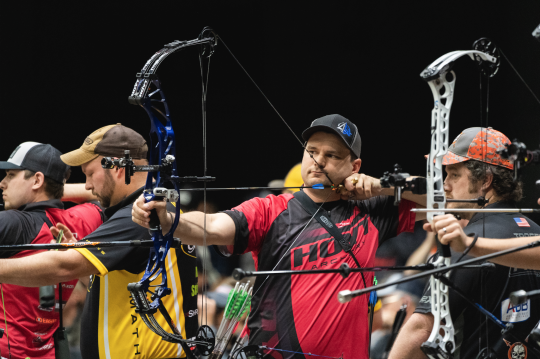 After each archer is placed in their respective brackets, they will go head-to-head shooting 3 ends of 5 arrows — if a tie occurs, a one arrow shoot-off will be forced. Steve Anderson climbed his way through head-to-head matches winning the First Dakota Classic. 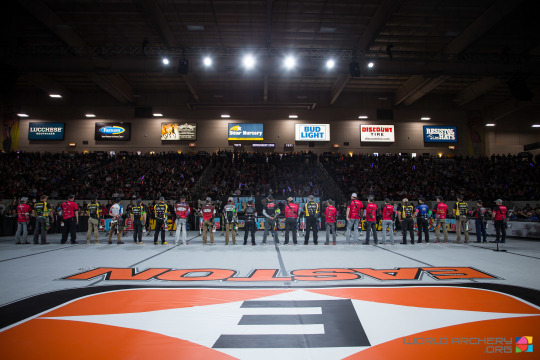 NFAA hosts a special 3 Star Tour $10,000 Shoot-off, eligible to those who competed at The Vegas Shoot, NFAA Indoor Nationals and the First Dakota Classic. Paul Tedford walked away with full pockets. Steve Anderson and Paul Tedford shooting off. Steve Anderson (Gold) and Paul Tedford (Bronze). Tedford with the $10,000 arrow. 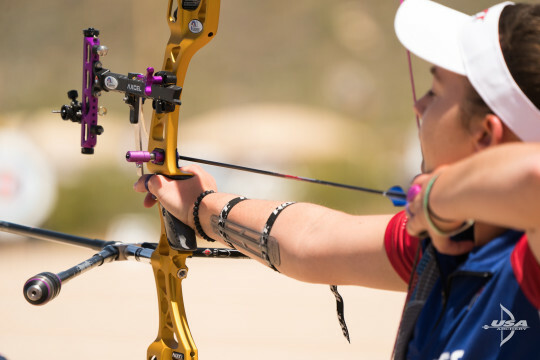 PHOENIX, Arizona — Arizona Cup, the first stage of the United States Archery Team qualifier event series. 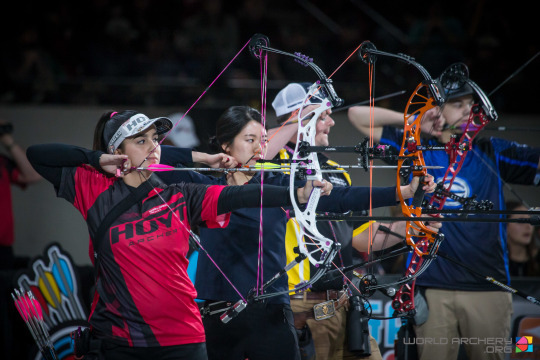 Each USAT event runs a similar schedule with archers having an official practice, qualification and elimination day. 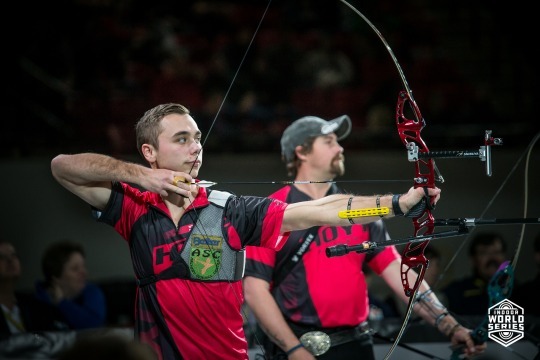 This tournament held back to back events with Olympic trials leading up to it and World Archery Championship Trials kicking off immediately after. 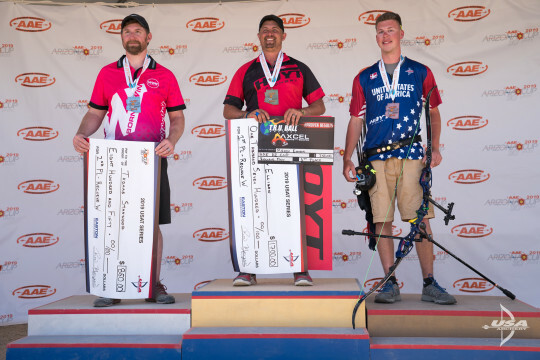 Team Hoyt performed exceptionally well through these three events in the Arizona heat. 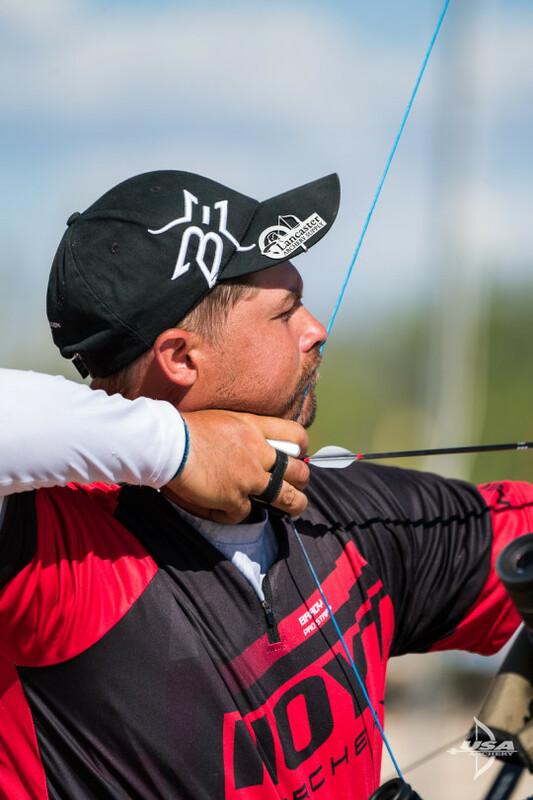 Brady Ellison competed in the Olympic Trial event along with Arizona Cup. Ellison won the AZ Cup taking home Gold. 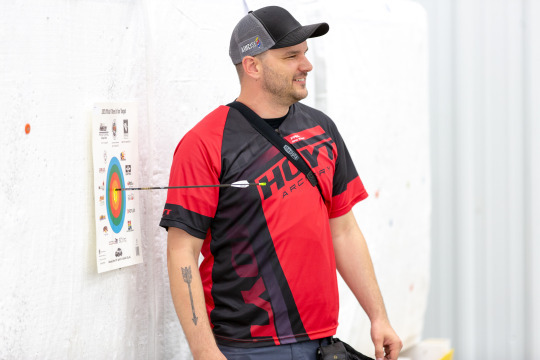 Mike Schloesser topped qualification with a 711 and finished out the tournament with a Gold. 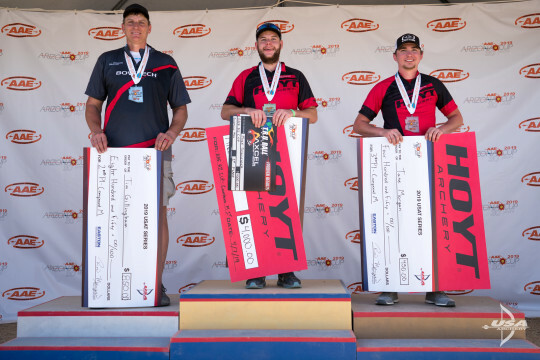 Young Casey Kaufhold finished strong in qualifications and won Gold for Sunday eliminations. 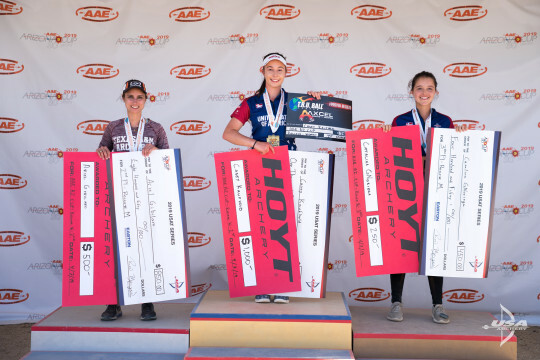 Hoyt Podium Sweep for the recurve women. Casey Kaufhold (Gold), Ariel Gibilaro (Silver) and Catalina GNoriega (Bronze). 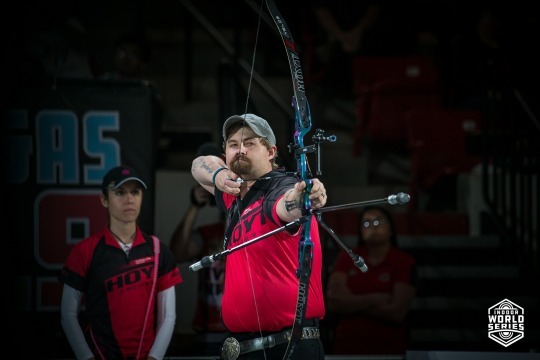 Team Hoyt’s Toja Ellison climbed her way to win Bronze. CINCINNATI, Ohio — NFAA Indoor Nationals is held this year in Cincinnati, OH and next year will move back to it’s famous location, Louisville, KY. 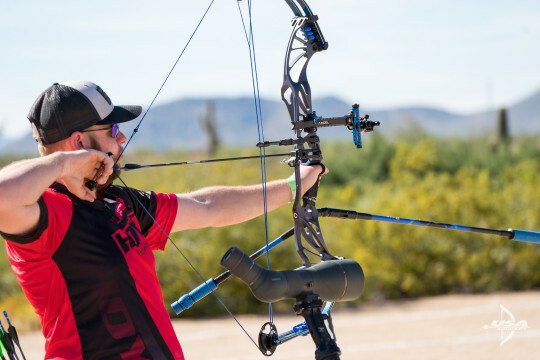 This event attracts archers from across the globe to shoot at the unique blue and white 5 spot target face. 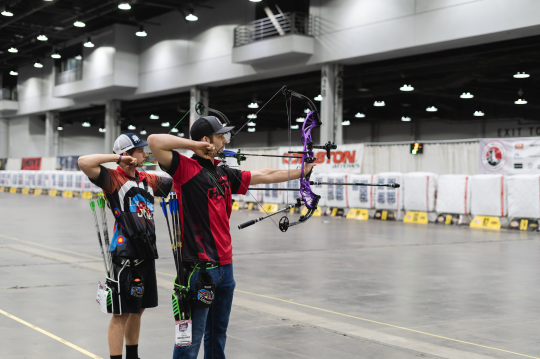 After two days of shooting, archers meet at the finals to go head to head for the Indoor National Champion title. 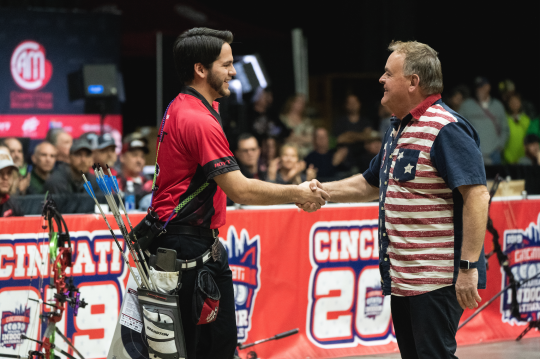 Carson Sapp meeting Bruce Cull after his introduction to the final shoot-off. 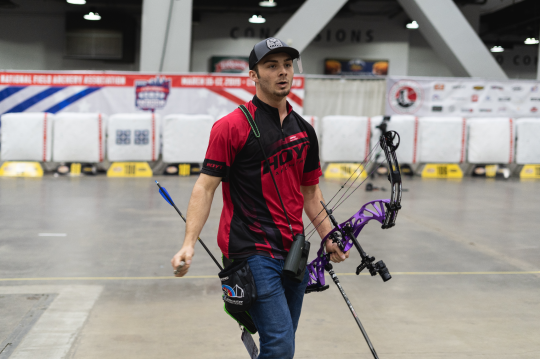 Sapp has won mulitple titles in the youth divisions at NFAA Indoor Nationals and this year shot 120x’s in the Pro Division to compete in the final shoot-off. 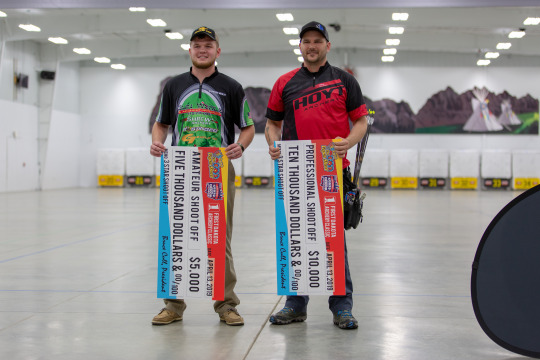 Brady Hempen and Tyler Heritage tied to force a shoot-off for first in Young Adult. Hempen soaking in a fresh Indoor National Champion title. 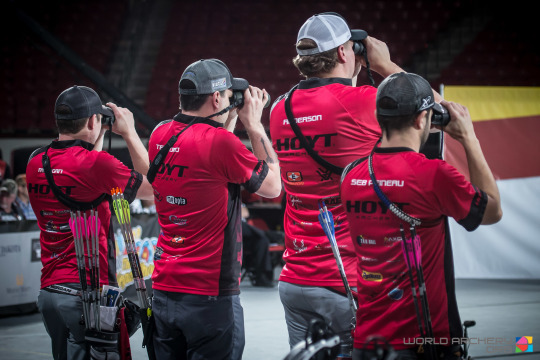 LAS VEGAS, Nevada — The Vegas Shoot is a world level event hosting archers, beginner to professional, from across the globe. Topping registration this year at 3,767. 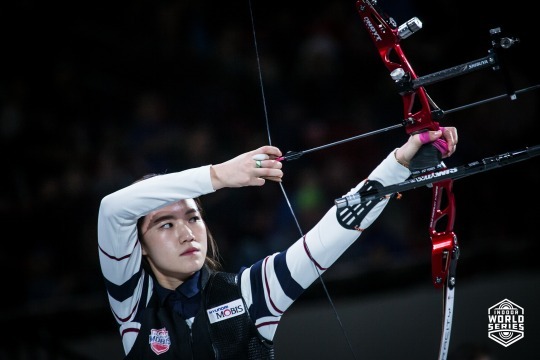 Among them, Sara Lopez and Chaewon So, finished the tournament with a perfect 900 score. 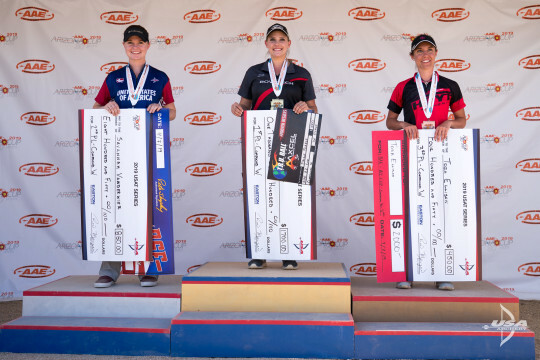 This was the first time in history two women forced a shoot-off with perfect scores. For the men, many made the famous 900 shoot-off including Sergio Pagni. 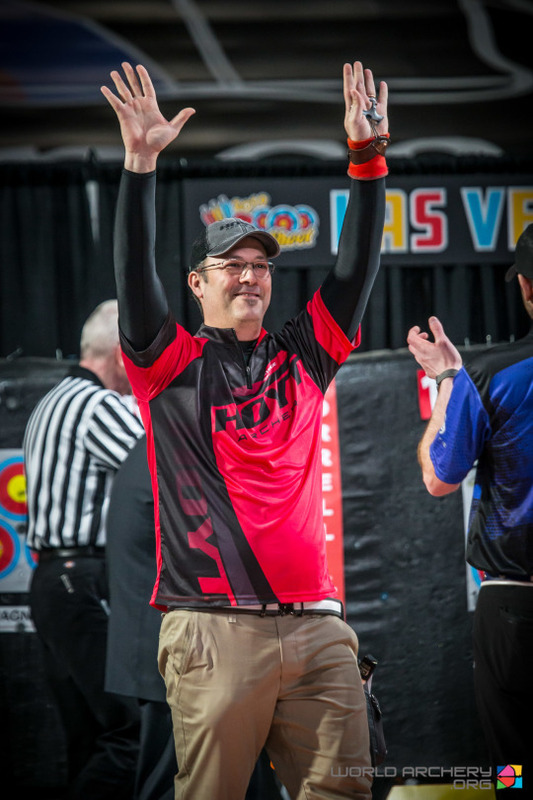 Previous Vegas Champion Sergio, was able to fight until the end and win another Vegas Champion title. 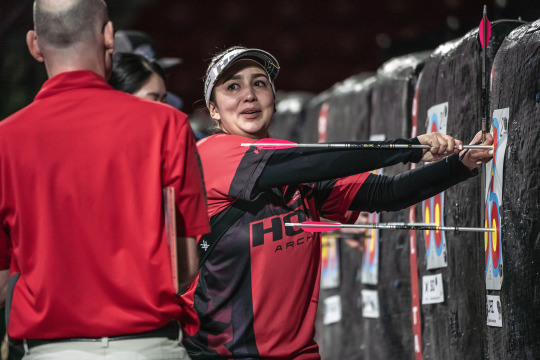 Sara Lopez moments after being announced The Vegas Shoot Champion. Lopez (GOLD) with So (SILVER) during final shoot-off. The compound men line-up for the 900 shoot down. Tate Morgan, Paul Tedford, Steve Anderson and Seb Peineau spotting targets. Sergio Pagni celebrating his Vegas win. 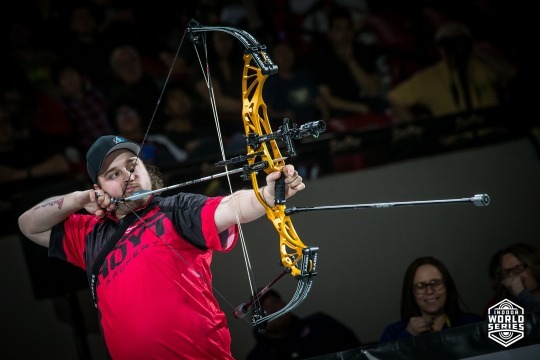 LAS VEGAS, Nevada — The Indoor World Series has come to an end with the Finals taking place in Las Vegas, Nevada. 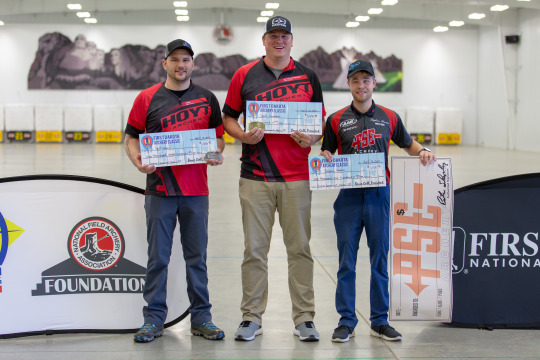 During this same weekend, these finalists are also competing at The Vegas Shoot. Each event holding their own unique style and tournament pressure. 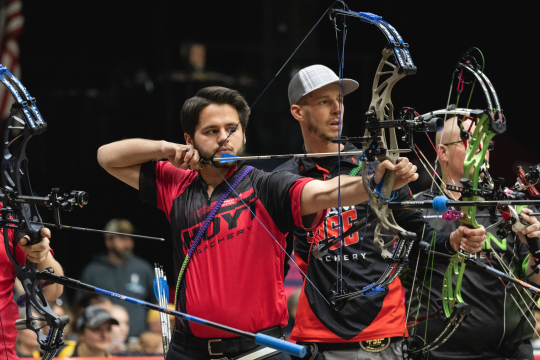 Congratulations to these Team Hoyt finalists. Kris Schaff (GOLD) on the Final stage in Las Vegas, Nevada. 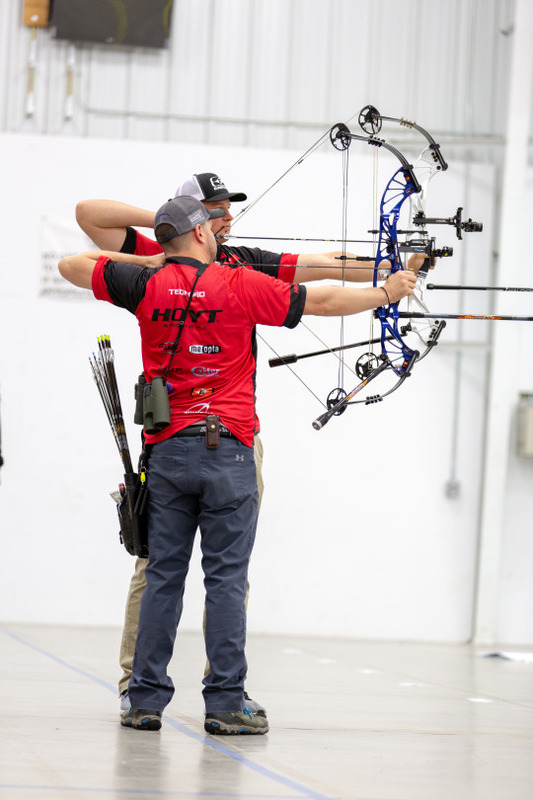 Steve Wijler (GOLD) going head to head against fellow Hoyt Pro Brady Ellison (SILVER). Brady Ellison (SILVER) with Toja Ellison coaching behind. Sim Yeji (GOLD) drawing back and steadying for Gold. 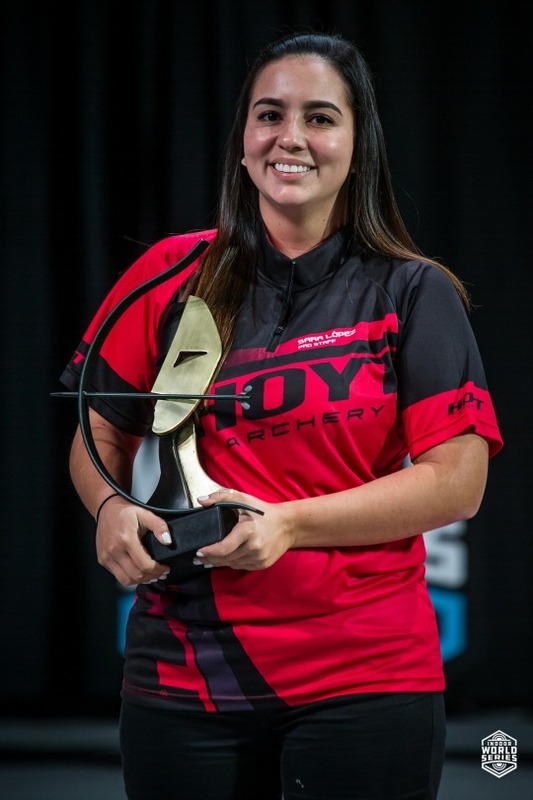 Sara Lopez wins World Archery Athlete of 2018. 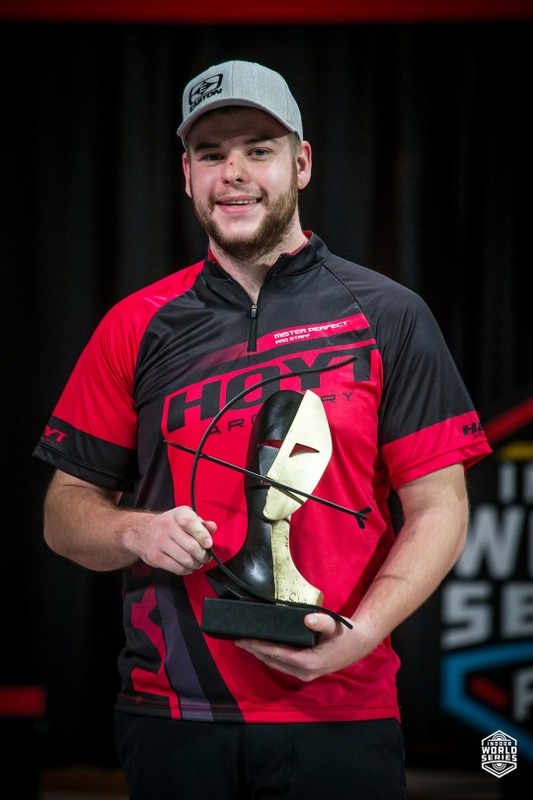 Mike Schloesser wins World Archery Athlete of 2018.